A Chance will be Given Oaklandon to Vote on Incorporation. The county commissioners have received a petition from a majority of the voters in the village of Oaklandon, Lawrence township, asking that the board order an election held there to decide whether the town shall be Incorporated. The feeling for Incorporation Is almost unanimous and the commissioners will order an election. 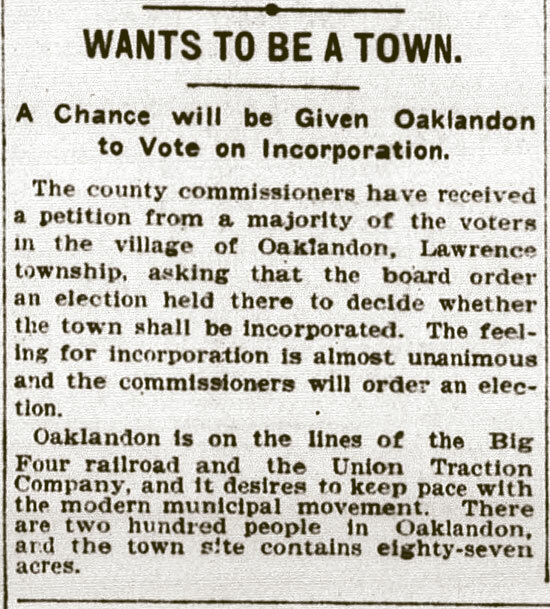 Oaklandon Is on the lines of the Big Four railroad and the Union Traction Company, and It desires to keep pace with the modern municipal movement. There two hundred people In Oaklandon, the town site contains eighty-seven acres.